Rent scooters and cars in Santorini. Bus. Excursion boats. Santorini is a small island to the surface area and you have time to see the whole island in a day by car or scooter. But then you do not have time to enjoy all beautiness, so it's better to take it easy. The traffic is anything but calm. To drive around Santorini with your own transport can be risky, the traffic is in places extremely intense, especially around Fira. The roads are narrow and the number of four-wheelers on the roads are many. An ATV takes as much space as a car, which creates stress among motorists. So you really have to be careful and pay attention to the traffic. Actually you ought to be equipped with three eyes: one to keep an eye on other road users, one to keep an eye of your own car or scooter and one eye that enjoys the beautiful and dramatic scenery. The road down to the port of Athinios. Do you see the buses on the road? If you can not or do not want to discover Santorini with your own transport, you can choose local bus, taxi, tour bus, excursion boat, beach boat or cable car. A well-developed and functioning local bus service connects almost the whole island. Fira is the main hub for the island's bus service. The somewhat chaotic bus stop lies just south of the Museum of Prehistoric Thira. Timetables are usually posted on the bus stops. Note that there is no bus between the airport and the port. 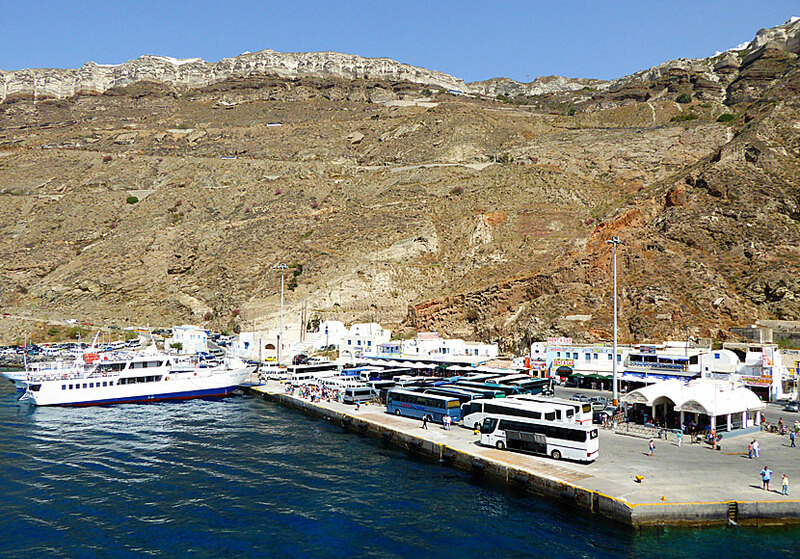 If you are going to the port, you must first go to Fira to change bus to the port, or take a taxi directly to the port. The cable car from Fira to the small port of Skala. 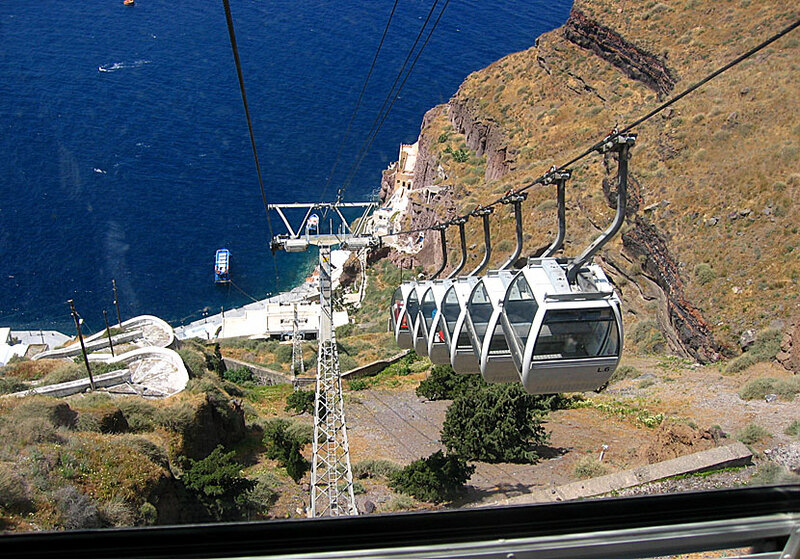 A cable car runs from Fira down to the small port below Fira. The cable car is powered by the municipality and shuttle up and down from early morning to late evening. It is said that the feeling to ride the cable car is both titillating and exciting. Personally, I would never dare to ride, because I'm afraid of heights. Markos, one of my friends in Santorini, works at the cable car, he has shown me around and explained all the equipment and tried to convince me how safe the cable car is. But it has not helped. The cable car lies close to the Archaeological Museum in Fira. There are plenty of taxis and there is rarely a problem to find an available taxi. Do always ask what the trip will cost before you get into the taxi, unfortunately it happens that one get deceived, nothing unusual in Greece. This applies especially to and from the airport and to and from the port. If you share a taxi to the port or to the airport with someone unknown, you should be prepared to pay full price anyway. Do not be surprised if you have to pay extra for luggage. A taxi to and from the airport and the port usually cost around € 20-25. There is a plethora of different excursions. Among other things, you can go on guided bus tours around the island, as well as guided tours by boat in the caldera. The excursion boats offers similar programs, usually the tours includes a visit to the volcano, swimming in hot springs, lunch at the neighbouring island of Thirasia and the sunset in Oia. Tickets for the excursions are sold at travel agencies. You can also ask your package-holiday operator if they arrange any excursions. 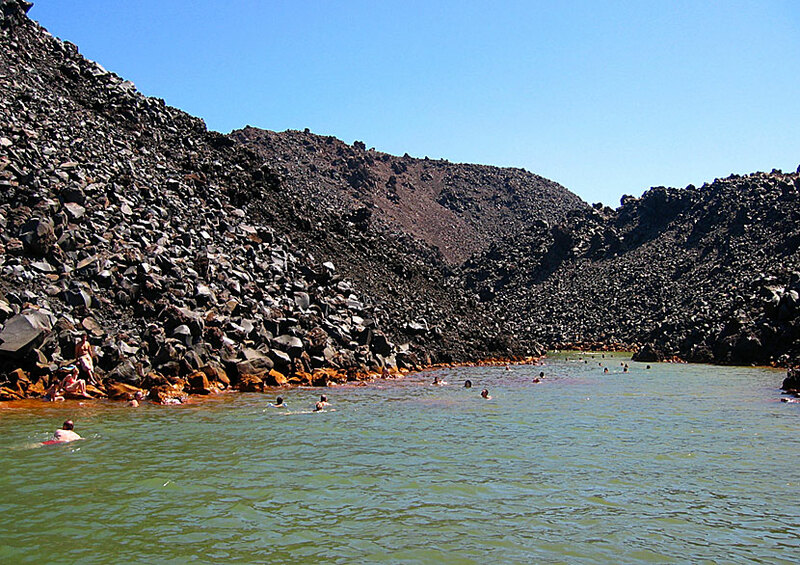 If you go on a boat trip, you can swim in the hot springs at the volcanoes. There are lots of donkeys in Santorini. Their work is to lug tourists up and down to the ports of Fira and Oia. Unfortunately, it has become known that some donkeys are mistreated, and it has launched various protest groups online. Although they are not treated badly, it is terribly exhausting for them to lug tourists up and down all day. In other words, avoid riding donkeys. 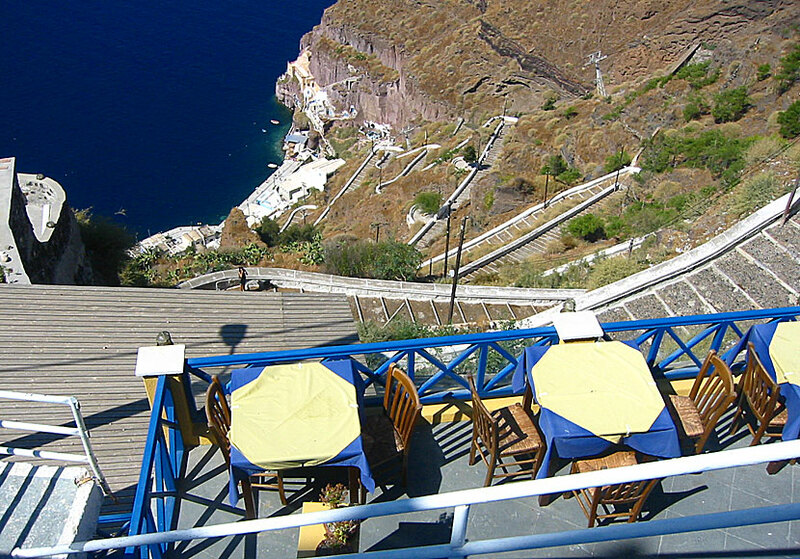 Santorini is a very good hiking island, So if you like to hike you will love Santorini.